I live in Venice anywhere from one weekend to one week a month. There is nothing in the world I like more than a good “bacaro”, the city’s historic standing bars where patrons order and drink directly at the bar counter. Over the years many bacari have expanded, also offering table service more in the style of the city’s osterie). Traffic hour in Venice...only there! The word bacaro (pronounced bàcaro, with the accent on the first “a”) derives from the Venetian habit of referring to a glass of wine as an ombra (what in Friuli Venezia they would call a tajut), the Italian word for “shadow”. This is because of the ancient practice of those who sold wine in Venice to place their stalls in the shadow of St. Mark’s bell tower in order to keep the bottles wine as cold as possible, for as long as possible. 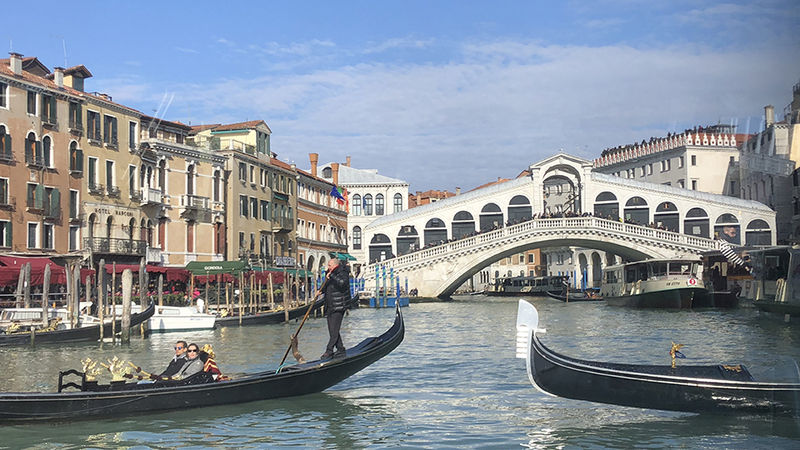 In fact, it is still common for us in Venice to say andar per ombre (or literally and poetically “going for shadows”) which means hitting the various wine bars during the mid-day morning break or for aperitivi at night. Historically, bacari were never full-blown restaurants, and were never the place where to have a complete meal. That was the realm of the osterie. The bacari were much simpler affairs, one of humanity’s original wine bars, ideal watering holes for all those who could not afford the time or the money for multi-course meals. In fact, the original bacari did not serve food at all, but limited themselves to serving drinks. People might stop for a quick bite on the go or grab simple (but tasty) food in the frittolin, small shops specialized in the frying of small fish served out of a paper cone and eaten while walking about, a local ancestor of street food. In this specific case, “walking” meant “walking over” to the nearest bacaro in order to wash down the fish fry with a good glass of wine. Therefore, all bacari are rather simple, even spartan, in their looks. Typically, they are very small, and do not have any chairs. Guests just eat and drink while standing at the bar or bring their drinks outside. Of course, not suffering from claustrophobia or anthropophobia is a big help as bacari can get quite packed with hungry (but usually well behaved) throngs of people. 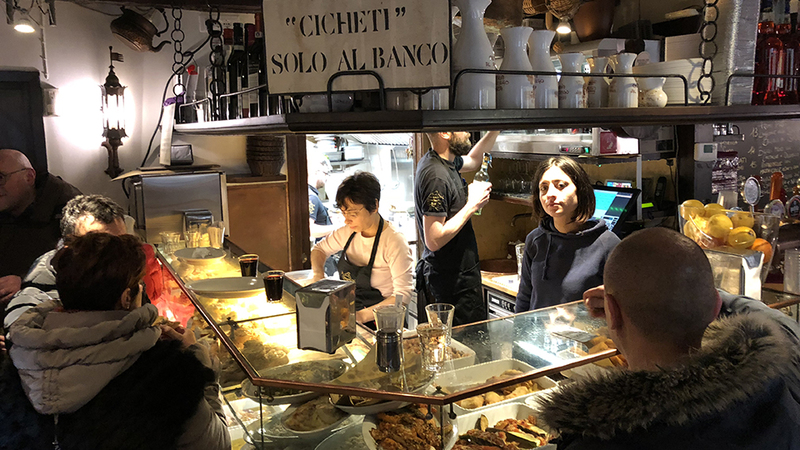 Through the centuries, the typical look of a bacaro has never wavered: dark wooden chairs, dark bar tables, a more or less small glass encased area where the cicchetti (or cicheti) Venice’s typical food snacks (similar to Spain’s tapas) are placed in full view of the hungry bacaro-goers. The food at most bacari is remarkably similar. Hearty and simply prepared, it is the freshness and quality of the ingredients that sets the various bacari apart food-wise. 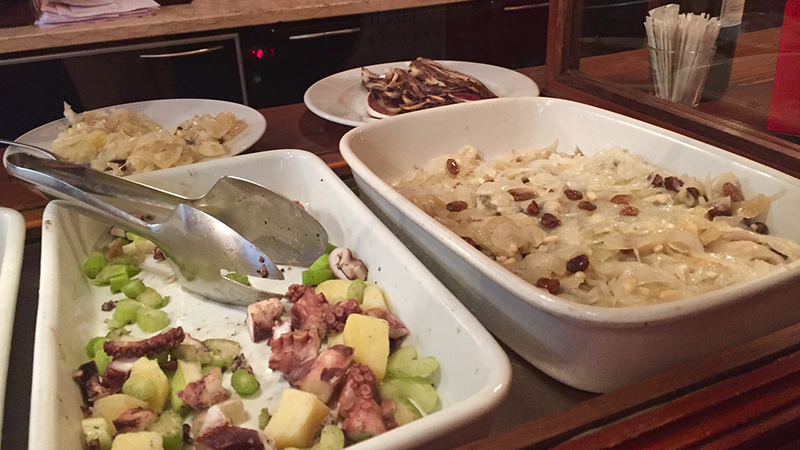 A list of the most famous cicheti of Venice includes grilled small squid, cuttlefish and peas, octopus in various sauces, marinated anchovies, some version of saor (a real Venetian staple, any saor preparation consists in the main ingredient, usually sardines but it might be something as different as pumpkin, marinated with onion, pine nuts and raisins in a mix of oil, vinegar and white wine), marinated eels, deviled eggs, eggs with anchovies, dried omelette with red Treviso chicory, polenta (in Venice, you’ll find it most often made from white corn meal, not yellow), baccalà mantecato (salted cod), meatballs, nervetti with onions (nervetti are the veal’s cartilage of the shin and knee), boiled beans, and fresh-fried anchovies. 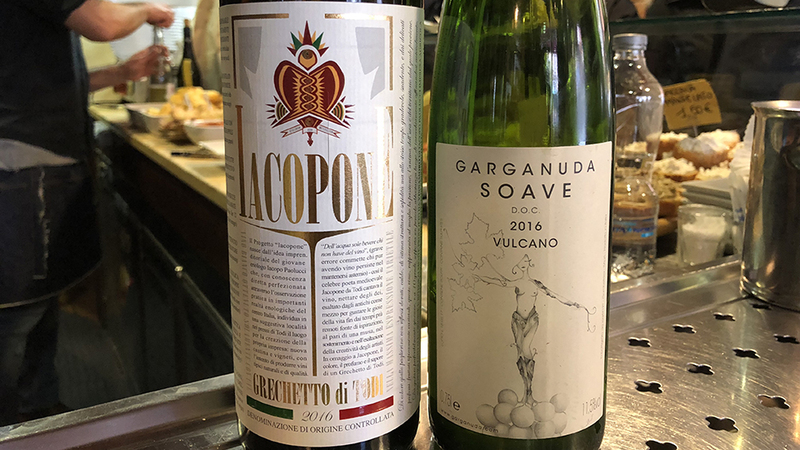 While the food is hearty, simple and very tasty but not especially different from bacaro to bacaro, the wine lists can differ immensely, with the wine range spanning from cheap, cheerful and very local, to famous and much sought after. Some of Venice’s bacari are truly historic and have been around for what seems like forever. These are some of my personal favorites. Aciugheta is more bistro than bacaro and offers lots of space and bright lights. The food is solid if not memorable and the wine list impressive, though on my most recent night there I was miffed by just how many different wines on the list were unavailable. Perhaps I just had bad luck on this night out with my wine choices, but this is something that hopefully won’t happen again on my next visit (otherwise, it will be my last time there). The place is run by the folks of Il Ridotto, the famous restaurant right across the small square and in fact one can choose to ask for that wine list too. 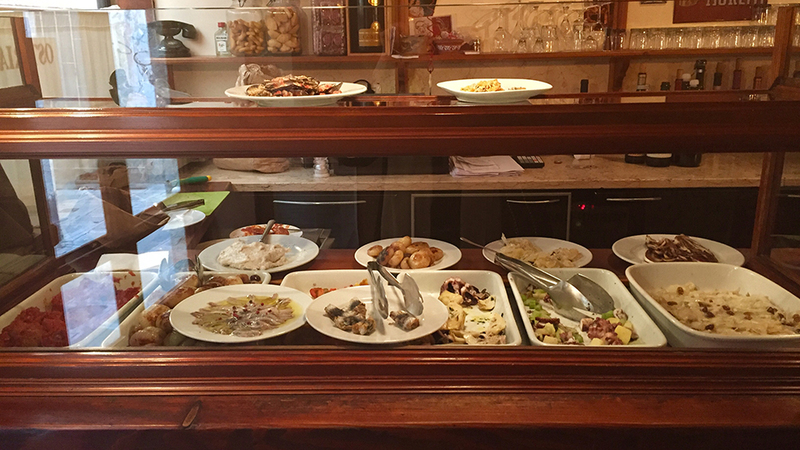 All'Arco offers a range of traditional dishes from Veneto as well as Venice such as marinated anchovies and baccalà mantecato, that all can be washed down with a decent choice of local wines. Bacarando in Corte dell’Orso is an upscale and large place, but getting to the bar counter and the food come lunchtime can be akin to scaling the Everest, given how packed it. Remarkably, nobody ever seems to blow a fuse, despite the kilometric wait). 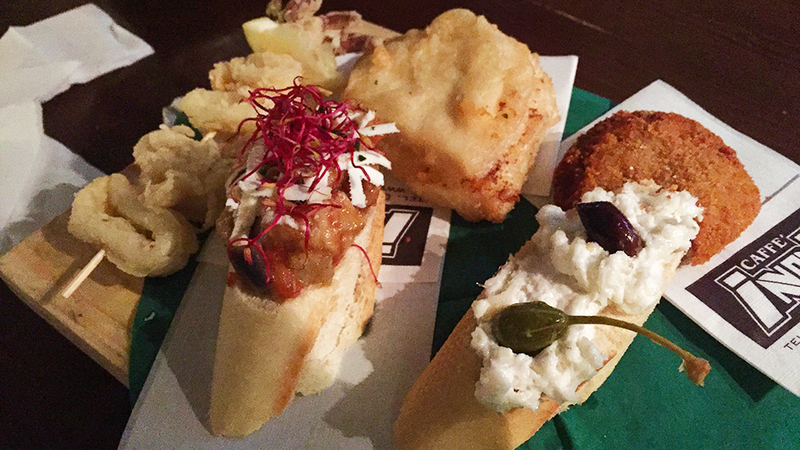 Once you have chosen your rather good-looking cicheti, the baccalà mantecato, fried calamari, and polpette are all quite good, the wine list is replete with wines from Veneto and Italy and choices are both good and varied. The ultra-traditional Bacaro Risorto lies just beyond Aciugheta, over a bridge and a small square. This is an archetypical Venetian bacaro: small, unbelievably cramped (you cannot open one of the doors to get in, for everybody is either sitting or leaning against it, so your only hope is to enter from a sliding door off to the side which proves far more efficient in letting you get in). Bacaro Ristorto requires you not to mind close human contact or to like eating at off-hours (really off-hours); try eating at the normal lunch hour and I guarantee you’ll feel like a water buffalo trying to get a drink in the desert’s only watering hole. The food at Bacaro Risorto is simple, tasty and honest, as are the rather idiosyncratic wines available. Bancogiro is both a bacaro and an osteria, is one of my favorite spots of all: the cicheti are copious, the wine list excellent (lots of choices from all over Italy) and the view, especially if you are able to snag a stool at the back in the main room is totally Venice, as you’ll have the water and beautiful old buildings staring right back at you. It’s the sort of place that Venice does so incredibly and uniquely well, and gives “grabbing a bite to eat” a whole new and very Venetian meaning. There is something like 600 years of history at Cantina Do Spade another one of the places where Casanova apparently liked to hang out (this bacaro, now actually more of an osteria where you can sit down, takes its name from a duel between noblemen on a nearby bridge in the 15th century). Cantina Do Mori, once better known simply as Do Mori, and located near the Rialto fish market, was founded in 1462. Apparently Giacomo Casanova was a regular. It is a beautiful, old-fashioned place with many demi-johns from which to pick wine, dark wood everywhere, and copper pots and pans hanging from the walls. It’s the only bacaro in Venice that has two entry points from two different calli (the calli are the alleys of Venice) and has been run by the same ownership duo for something like twenty years. 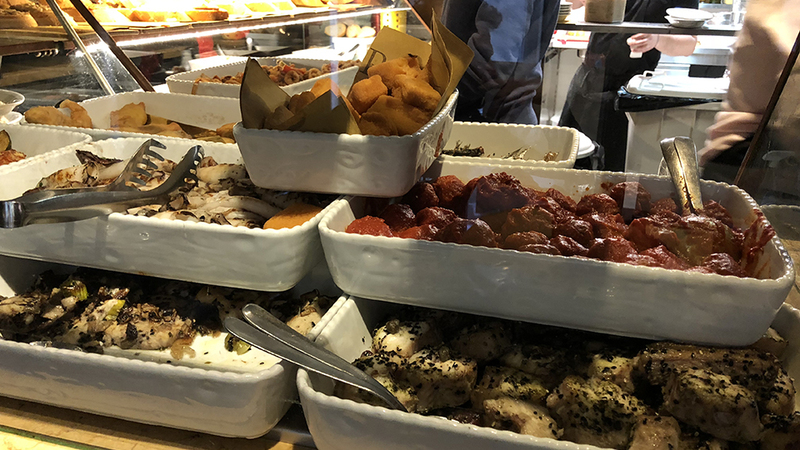 It’s the place to go for outstanding baccalà, the francobolli (or “stamps”, in English), Venice’s famous ultra-small sandwiches, and many varieties of meatballs, but they also have some primi should you feel especially hungry. Make sure you are not too tired to stand and wrestle with the hungry crowd. When it comes to meatballs, Venice’s best are those of Ca d’Oro alla Vedova. Tucked away in a small alley; it is another of Venice’s oldest bacari (established in 1891). Today it is part bacaro and part osteria (mostly osteria, actually) but if you want to sit down, you must reserve ahead (at lunchtime, the place gets so amazingly packed that even standing there while trying to gobble down food and wine becomes a chore). The wine list is small but is full of excellent estates, such as Primosic and Pieropan. Wine is one of the main calling cards of Enoteca Cantinone Già Schiavi, where the impossibility of sitting down stings less thanks to a selection of five hundred different wines. I Rusteghi Osteria is also upscale, but amazingly small (something like two or three tables only inside tightly packed quarters and an even smaller standing bar area) but features outstanding salumi and above average wine selections, including older vintages of famous Italian wines and a solid lineup of French greats. Osteria al Portego is another dining spot that offers a bacaro-osteria combo that is one of Venice’s best; in fact, be aware that should you decide to reserve a table and sit down in the room’s back area, dishes such as the delightful pastas can be quite inventive (the bigoli mori con castagne and ossobuco, for example) and the portions quite copious. While the bacaro area upfront can get quite packed and noisy, the back room is quieter and more relaxed. I think it is fair to say that the wines here are few and local, but not the main cause of attraction. 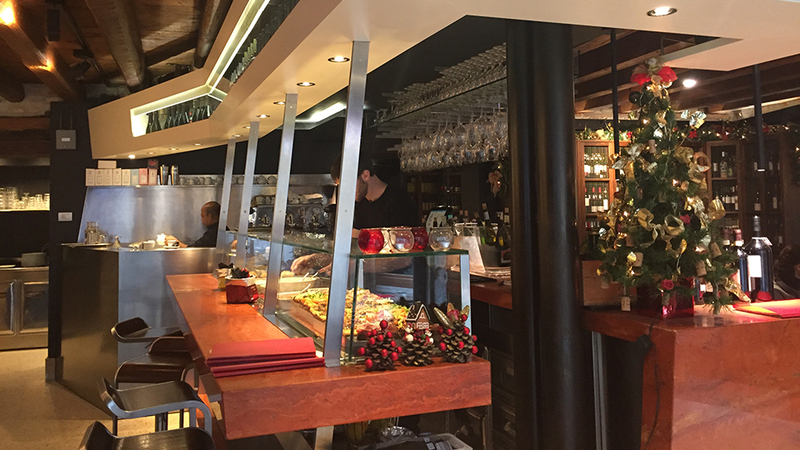 One of my favorite dining stops is the Osteria La Bottega ai Promessi Sposi which is a little brighter and more spacious than most other bacari. The food is very good and very fresh, and the wine list, though simple, is well above average with rare regional wines by the glass or by the bottle, such as Serafini & Vidotto’s excellent Recantina (a medium-bodied red wine made from the local native grape of same name).